Houghton Mifflin Harcourt, 9780547451251, 272pp. 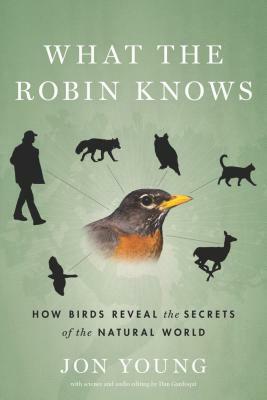 A lifelong birder, tracker, and naturalist, Jon Young is guided in his work and teaching by three basic premises: the robin, junco, and other songbirds know everything important about their environment, be it backyard or forest; by tuning in to their vocalizations and behavior, we can acquire much of this wisdom for our own pleasure and benefit; and the birds' companion calls and warning alarms are just as important as their songs. Birds are the sentries and our key to understanding the world beyond our front door. Unwitting humans create a zone of disturbance that scatters the wildlife. Respectful humans who heed the birds acquire an awareness that radically changes the dynamic. We are welcome in their habitat. The birds don't fly away. The larger animals don't race off. No longer hapless intruders, we now find, see, and engage the deer, the fox, the red-shouldered hawk even the elusive, whispering wren. Deep bird language is an ancient discipline, perfected by Native peoples the world over. Finally, science is catching up. This groundbreaking book unites the indigenous knowledge, the latest research, and the author's own experience of four decades in the field to lead us toward a deeper connection to the animals and, in the end, a deeper connection to ourselves.